Dogs are such an integral part of our family. We love them fiercely and know they love us! 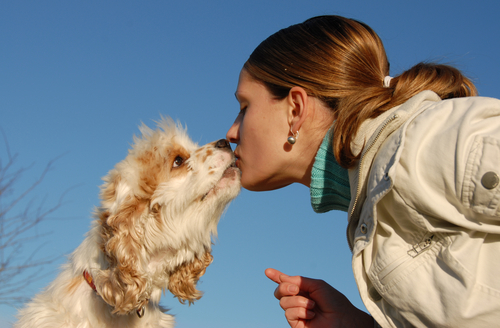 But, some dogs give kisses to almost everyone they meet, while other dogs are a little more selective when showing their love. How do you know if your dog really loves you? Let me count the 8 ways. Dogs are pack animals, used to cuddling up in dens with their families. If your dog likes sleeping with you, on the couch, a chair or under the covers, it’s a sign that she sees you as part of her pack. So if you wake up to doggie breath in your face, your dog thinks of you as family. Not only does this mean your dog wants to play with you and is sharing, but when your dog brings you his favorite squeaky to, it means he thinks of you as a pack leader. He wants to please you by offering a tennis ball or chewed up stuffed animal because your pup thinks you might just like it too! In a recent study in Japan, dogs were introduced to their parent, a stranger, a dog toy, and an item they didn’t like. When seeing their parent, the dogs immediately lifted their eyebrows (especially their left). When they saw a stranger there was significantly less facial movement, and it was movement of the right brow like a wiggle. When your dog follows you from room to room and is always beside you…that is a true sign of love. He wants to hang out with you at all times! When your dog looks you straight in the eyes, it’s not meant as a sign of aggression. Eye contact between dogs and their humans is a sign of love as it has been found that eye contact releases oxytocin, the bonding hormone, in both dogs and owners. Yawning is contagious among humans because of a biological empathy and now it’s believed that dogs do the same thing! A 2008 study showed that dogs were more likely to accompany a yawn when they saw their owners yawn than when they saw a stranger do it. So if your dog yawns every time you do, it’s a sign that he cares and really loves you! For dogs, licking can mean a number of things. Some dogs lick their humans’ faces because it’s a habit, or because they like the way their owners taste (or you might even have food on your face). But, most dog licks are a sign of affection and that you are family! When you walk in the front door and you are eagerly greeted by your dog, tail wagging with a toy in his mouth (and probably lots of jumping too! ), this is also a sign of love in its truest form (and we got all three-in-one of the love signs. How does your dog show you he loves you? And when you show affection, does your dog like to be hugged?